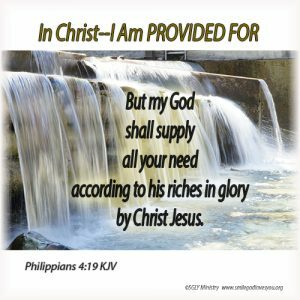 Believers, as we have been seeing daily, in Christ all of our needs are met, spiritually as well as physically, for God, from His rich source of supply provides for us day and night. Whatever it is we might need, He generously gives. Now we might at times question whether that is so, because often what we think we need is really not a need according to God’s plan for our life, and so at times our wants are not supplied, but our needs, according to God’s plan and purpose for us, always are.